Tis the season for tree trimming parties and the perfect gift is a hand knit ornament. Since it’s still early in the holiday knitting season I still feel okay about knitting up something fancy like these little lovelies! 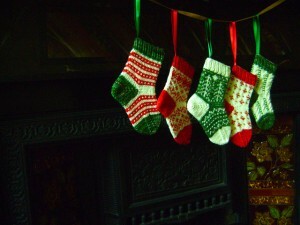 These are For The Tree by Coop Knits and they are truly adorable. They are knit up in sock weight yarn so a couple of skeins will go a long way. The question isn’t really whether or not to knit up one or 20 of these but which colour pallete. Traditional red, white, and green? A Suessical Chartreuse? Perhaps a quirky pink, green, and white? A golden pallette? Wintery blues? The possibilities are endless! This entry was posted on Saturday, December 3rd, 2011 at 12:33 am	and is filed under Uncategorized. You can follow any responses to this entry through the RSS 2.0 feed. Both comments and pings are currently closed. Love them! I’d got with the traditional colour scheme.